I love working with children and teenagers. You can call it media-education, film-making or just play. To me it’s bringing people through a creative experience, where we can have fun exploring ideas, learning things and expressing ourselves. I often choose to shoot with a simple webcam, because a low-tech profile pushes you to develop better ideas. I also like leaving the message that every body can be creative and have fun, no matter how much money you have. A stop-motion workshop making creatures from wastes. At Maremetraggio Film Festival. A comedy about bullying, made by the young partecipants to a 5 days long workshop by Scatola Magica. Eleven thoughs about gender identity and gender violence. Written and animated by high school students. An ecological advertising for a Legambiente campaign. Produced by Cinemovel. Animations made by children at a stand during the fair. Two animations made by 7-11 years old children at Festival della Mente. Crazy commercials made by the young partecipants to a 5 days long workshop by Scatola Magica. Social advertising against mafia. Done at a Libera and Cinemovel camp in Palermo. Here some video comments. Short film made by the young partecipants to a 5 days long workshop by Scatola Magica. A little short about cinema done by 10 children in 13 hours. Children have colored and built the 2D puppets, than they have animated them. Four suggestions about gender identities, witten and animated by high school students from Lucca and Viareggio. Animations about gender identity, made by teenagers in Lucca Comics 2014 in 2 hours long workshops. Three animations invented and animated by children during 1 hour long workshops at Lucca Comics 2014. The given theme was genre identity, with all the related problems. Pairs or group of objects were at disposal of the teenagers who took part to the workshops in Lucca Comics 2013. 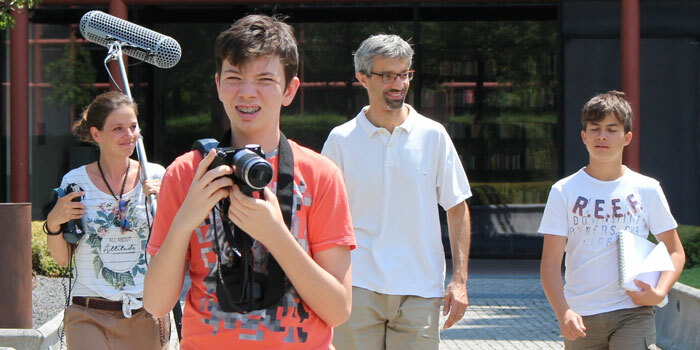 Two stop-motion workshops at Lucca Junior, during Lucca Comics and Games 2013. The main challenge was to lead a group of children to make up an idea and to animate it in just one hour. The given theme was the wall. All the other decision were taken in democracy. 20 hours long workshop with two dozens of teenagers. Inspired by Sean Penn’s feature film, they came out with a parody, on the song Into the Wild by Rumba de Bodas. When the mind is animated, you don’t need to use a drug. Nine animated spots about drug prevention, written and animated by many high school students in Lucca town and Province. A videoclip on a hilarious song by Elio e le Storie Tese. A five mornings workshop with 12 Turkish lovely students on an organized holiday in Italy. It was such an effort to pull out energy from them, but they did great. We are honored to have received the enthusiastic feedback from the famous Italian rock band. A selections of animations made in workshops in different towns of Italy. I love this buttons: happy to be simple. To me it’s so preacious to meet children and improvise animated stories starting from the objects around us. Without any sermon, we learn watching the world from different perspectives and changing it. And it’s so fun. Every animation was made in about 75′ long workshop with 5-6 years old children.